Not all of us are game or fancy those permanent black green tattoo but those glittering feminine tattoos are now an in thing during recent line dance parties. You can be stylish too, without having to endure the pain of tattooing and carry the permanent mark forever (perhaps risk regretting about it many years down the road). Temporary stick-on tattoos can be purchased in many accessories shops. They are easy, pretty, glittery and most of all, temporary and cheap! At my upcoming Spicy Bollywood party, Christina Lee, an avid line dancer, will be going her rounds of creating fresh-made glittery tattoos for the guests. She is currently doing this for charity and hoping to collect funds for charity purposes. 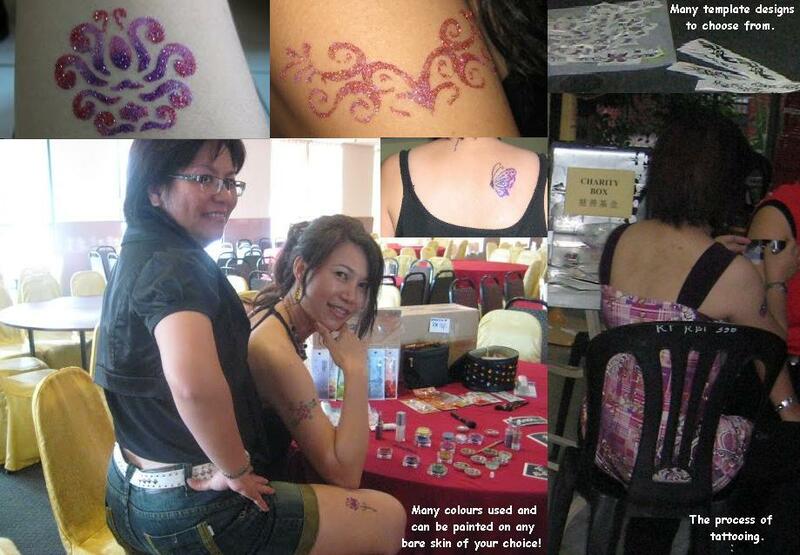 Each tattoo costs RM10 and will only take minutes to be done. They can be done on your shoulders, chest, back, naval, thigh or arms (or anywhere else you want!). Do give her your support. Note: Chris will be at Lakeview Club from 11.30am onwards to do the tattooing until 1.30pm.